I bought another kitchen toy. I did not buy the cook book that used canned soups in the slow cooker. I decided that if I can’t figure out how to adapt my own recipes to the slow cooker without the aid of condensed soups, I shouldn’t own one. Since it was my new toy it seemed only fair that mon mari get to choose the first recipe. Bless his heart – he picked something easy: Coq au Vin. .
Pour enough wine over to cover and refrigerate at least 4 hours or overnight. Heat oil in skillet over medium-high heat. Add bacon and fry until crisp. Add shallots to skillet and lightly brown. Add chicken to skillet and brown on all sides. Add a bit of marinade to the skillet to get all the good bits, stir well and add to slow cooker. Add all vegetables and herbs from marinade to chicken and enough of the marinade to almost cover the chicken. Add more wine if needed. Cover and cook on low for 7 – 8 hours, stirring / rearranging chicken once or twice. Using a ladle, remove as much of the wine sauce as possible and put into a saucepan. Turn slow cooker off but leave chicken in and cover to keep warm. Put cocoa into a small bowl. Slowly whisk in 1/2 cup sauce. Dissolve cornstarch in water. Use to thicken sauce to desired consistency if needed. (The cocoa will thicken it slightly.) I used about half – the sauce is supposed to be a bit thick but not gluey. Arrange chicken and vegetables on a small platter. Spoon some sauce over and serve the rest on the side. I did what I always do when I’me buying something unfamiliar. First I do a bit of generic on-line research. I looked at various models and sizes and manufacturers; checked out the reviews and opinions. Then I go to Amazon UK to see what’s available on this side of the pond and to read the Amazon reviews. Inside the big box was a medium box and a small box. The medium box was the slow cooker and the small box was a plug converter….. It was a British slow cooker with the usual monster 3-prong electrical plug which doesn’t work here in France. It’s the little things that keep life interesting…. Back to the food: The Coq au Vin was wonderful. The chicken very moist and tender. I made a few adjustments to the recipe – I added the shallots and mushrooms at the beginning instead of half-way through the cooking time because I didn’t want to fuss again. Slow cookers are supposed to be easy. And I left the carrot and onion from the marinade in the dish – why not? We didn’t notice any difference. I was much happier doing all the prep work in the afternoon rather than at dinner time. Normally Coq au Vin takes a bit under 2 hours, which means that I’m in the kitchen for those 2 hours before dinner. This was easier. More slow cooker recipes in the future…. lots more, actually. Boo on the plug issue. There is a little learning curve on a slow cooker but when a recipe works well, as your Coq Au Vin, it seems pointless to engage in extra fuss. 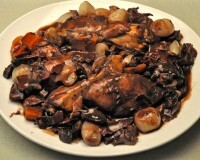 Great looking coq au vin, a favorite anytime. Your coq au vin looks wonderful! I have to admit, I do love my slow cooker. Then again, I work every day, leaving at 6am and getting home at 5pm, so getting everything ready the night before and just setting the timer the next morning is a fabulous thing to do. Sometimes, it takes a bit of finagling to get the recipe to work, but I don’t really make anything with canned soup in it either. The reason I started writing slow cooker cookbooks was not using any cans execept pure tomatoes 😉 And I admit I own 4 different slow cooker sizes. I know you are WAY better than me at coming up with your own recipes, but if you ever need any inspiration, I often get recipes from the “365 crockpot” blog. The large majority of her recipes are made from real food and are fairly healthy, so I usually turn towards her site when I know I’ll be using my crock pot! It looks great . mom Mari chose well. Do you think any Amazon anywhere would deliver to Marrakech ? Tanna, life is always full of surprises here lol. Nightsmusic, I’m sure it will take some getting used to – esp since I don’t like to bother with directions…. kuchenlatein, I didn’t know you had cookbooks…. are any in English? k_sam, thanks for the site…. 365 sounds like there should be some good inspiration. Katie, I am looking forward to more slow cooker recipes from you. I know they will be worthwhile. The coq au vin sounds wonderful.